Welcome to Queer Beats, your weekly one-stop shop for queer television news! This week, Aisha Dee talked Kadena, Killing Eve got the attention it deserves, and the Legends of Tomorrow cast had Good Fan Fun at Fan Fest. 95% of this trailer features men but I’m staying positive through gritted teeth. She also (finally) got her own poster, too! It’s a photo we have already seen, but I’ll take it! This is why I love the women of the Arrowverse. I’ve never really been part of a ‘ship’ that people are so voracious about. There are times when I’m not fully equipped and it’s kind of overwhelming. But I think, in general, it’s been really beautiful to see people embrace this couple. Because, it’s so rare to see two women of colour in love, on TV, or in movies. So, I’m really proud to be, you know, one half of this thing that people are really vibing with. I think it’s been really special and there’s some pressure involved there. I don’t want to disappoint anyone, and I wanna make sure that we’re telling a story that feels real. But, above all else, it’s a story about love and it’s a story about two women who genuinely love each other. Does anyone else feel like Steph is in character as Rosa here? I ship it and no one can stop me. Thankfully, Sandra Oh is getting all the praise and recognition that she deserves. It was quite a week for her! She was named one of EW’s Entertainers of the Year, as one of the hosts of the 2019 Golden Globes, and Killing Eve was named Best of 2018 by iTunes. On top of all of that, both she and Killing Eve were nominated for Golden Globes! The only thing missing is a nomination for Jodie Comer! The Killing Eve crew even celebrated together! Everything seems so peaceful when they aren’t trying to kill each other! Cutest cosplay definitely goes to this baby Black Canary. Finally, she posted this real cute picture of her with Caity and Tala. For the Caity fans out there, she recently talked about Avalance and their role in the show. She spoke about how sometimes characters can get lost in their relationship but they are trying to combat that on the show. And I think they are doing a great job! Can we all agree that Caity’s knitting (crocheting?) cuteness is unbearable? She also posted a dancing portrait and, to be transparent, anything to do with Caity dancing makes my heart swoon. #tbt ✨ I’m deeply grateful for everything dance has given me: amazing friends, a strong worth ethic, connection to my body, and it led me to live a creative life. It made me realize I could live whatever life I wanted to create. Maisie has decided that Charlie is pansexual and now it is law, in my eyes. And Tala posted multiple pictures including Maisie on Instagram. These are receipts to prove that I’m not crazy! It’s clear that they are trolling us. Right? RIGHT? Anyway, back to reality, I want to give a shoutout to one of my favorite fandom creators, Paris. She creates custom Funko Figures for many wlw characters and, this holiday season, she created a bisexual pride version of Sara Lance. RT this tweet for a chance at winning her! 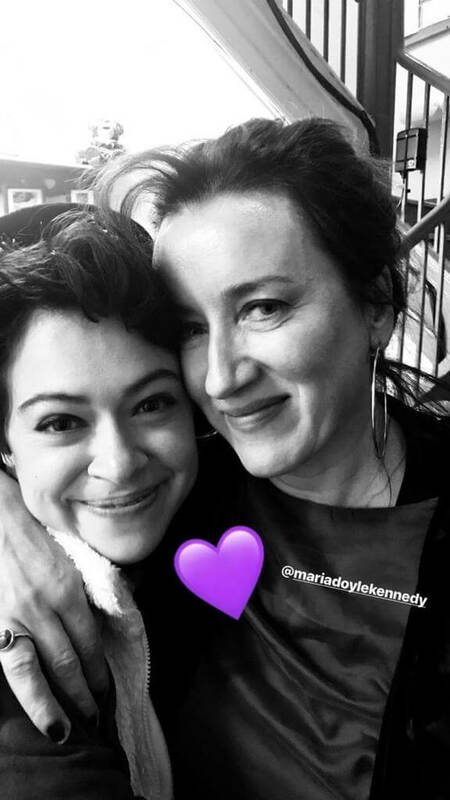 And, for my final thought, if you watched Orphan Black, the fact that this picture (from Tatiana‘s Instagram story) made me cry shouldn’t be surprising.